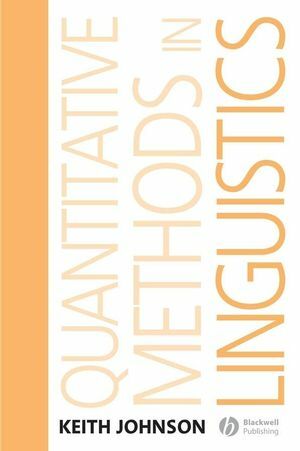 Quantitative Methods in Linguistics offers a practical introduction to statistics and quantitative analysis with data sets drawn from the field and coverage of phonetics, psycholinguistics, sociolinguistics, historical linguistics, and syntax, as well as probability distribution and quantitative methods. Keith Johnson is Professor of Linguistics at the University of California at Berkeley. He is the author of Acoustic and Auditory Phonetics, Second Edition (Blackwell, 2002), as well as numerous articles on phonetics and speech perception. 1. Fundamentals of Quantitative Analysis. 1.1 What We Accomplish in Quantitative Analysis. 1.2 How to Describe an Observation. 1.3 Frequency Distributions: A Fundamental Building Block of Quantitative Analysis. 1.5 Is Normal Data, Well, Normal?. 1.6 Measures of Central Tendency. 1.8 Standard Deviation of the Normal Distribution. 2.3.1 The Central Limit Theorem. 2.3.3 H0: µ = 100. 2.3.4 Type I and Type II Error. 2.4.3 Amount of Variance Accounted For. 3.1.1 Cherokee Voice Onset Time: µ1971=µ2001. 3.1.2 Samples Have Equal Variance. 3.1.3 If the Samples Do Not Have Equal Variance. 3.1.4 Paired t Test: Are Men Different from Women?. 3.2 Predicting the Back of the Tongue from the Front: Multiple Regression. 3.2.2 More than One slope: The bi. 3.3 Tongue Shape Factors: Principal Components Analysis. 4.1 Analysis of Variance: One Factor, More than Two Levels. 4.3.1 An Example of Repeated Measures ANOVA. 4.3.2 Repeated Measures ANOVA with a Between-Subjects Factor. 4.4 The “Language as Fixed Effect” Fallacy. 5.1 When the Data are Counts - Contingency Tables. 5.1.1 Frequency in a Contingency Table. 5.2 Working with Probabilities: The Binomial Distribution. 5.3 An Aside about Maximum Likelihood Estimation. 5.5 An Example from the [∫]treets of Columbus. 5.5.1 On the Relationship between x2 and G2. 5.5.2 More than One Predictor. 5.6 Logistic Regression as Regression: An Ordinal Effect - Age. 6.1 Cladistics: Where Linguistics and Evolutionary Biology Meet. 6.2 Clustering on the Basis of Shared Vocabulary. 6.3 Cladistic Analysis: Combining Character-Based Subtrees. 6.4 Clustering on the Basis of Spelling Similarity. 6.5 Multidimensional Scaling: A Language Similarity Space. 7.3 Linear Mixed Effects in the Syntactic Expression of Agents in English. 7.3.1 Linear Regression: Overall, and Separately by Verbs. 7.3.2 Fitting a Linear Mixed-Effects Model: Fixed and Random Effects. 7.3.3 Fitting Five More Mixed-Effects Models: Finding the Best Model. 7.4 Predicting the Dative Alternation: Logistic Modeling of Syntactic Corpora Data. 7.4.1 Logistic Model of Dative Alternation. 7.4.2 Evaluating the Fit of the Model. 7.4.3 Adding a Random Factor: Mixed Effects Logistic Regression. This file is stored in a ZIP archive. If your computer is not capable of opening ZIP archives, you can download a trial version of WinZip at WinZip.com.